Download the Zapp! English Super Pack (Level 3 - Upper Intermediate / Advanced) today and experience the first English course of its kind to be based entirely on REAL, unscripted English conversations. With Zapp! English YOU choose where and when you study, and we guarantee you'll make huge progress with your English. We have designed the Zapp! English Products (Zapp! English Vocabulary & Pronunciation, Zapp! English Colloquial and Zapp! English Listening) to fit together in a comprehensive way, making sure that each product complements the others and builds on what you have already learned. This is the reason you will see that the 32 classes have the same topic across all our packs at a particular level. This means that as well as getting lots of new understanding and practice with new words and skills, you will also be revising the ones from the other elements of the course without even realising it! Anybody who has spent any time studying a language knows that simply checking what a word means, and then moving on to the next doesn't mean you learn it. Studies show that you need to be repeatedly exposed to that word or phrase in as many different ways as possible. By linking our components, we have ensured that this will happen naturally. Complete all units of each pack individually in this order: Zapp! Vocabulary ⇒ Zapp! Colloquial ⇒ Zapp! Listening. Take a unit topic (e.g. 3.9 – Globalisation) and work though a unit at a time of Zapp! Vocabulary, Zapp! Colloquial and finally Zapp! Listening. You will then feel a lot more confident and be a lot more fluent in that particular topic, before you move onto the next. Zapp! English is not some crazy new 'method' of learning English. It's a fresh way of applying the most up-to-date and professionally accepted language teaching principles. 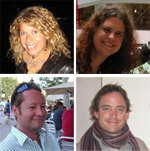 At Zappenglish.com we are all highly experienced English language teachers holding internationally recognised qualifications and we have taught students and teachers from all around the world. We make real English Conversations accessible and interactive. We'll be setting you tasks, asking you questions and making you laugh, and with 5 years' podcasting experience, more than 4 million podcast downloads, and two number one podcasts in iTunes, we have the experience and ability to help take you to English fluency! How Will Zapp! English Super Pack Help YOU? Zapp! English Super Pack is the first English language audio product to be based entirely on real unscripted English conversations and featuring a wide variety of international and regional accents. We're confident that you won't find another English learning product like this! Following are some of the many benefits you will get from this revolutionary English learning product. You will see an enormous improvement in your ability to understand and participate in Real English Conversations. You'll learn mountains of new vocabulary as used by native speakers every day! Your English pronunciation will improve noticeably. You will learn many common Colloquial English expressions not normally taught in class. Your understanding of English TV and movies will improve. You will learn to understand different English accents. Each unit is designed for repeated listening meaning you'll never get bored! You can get started immediately, and study wherever and whenever you choose. What does the Zapp! English Super Pack pack include? The pack includes 96 MP3/audio files (approx. 30 hours of audio!) and 96 ebooks in PDF format (with more than 1,300 pages of transcripts and exercises). Real unscripted English conversations with authentic background sounds. Multiple regional and international English accents. Colloquial English not normally encountered in the classroom environment. Audio classes to check your understanding, and practise pronunciation. Ebooks with full transcripts of the conversations and classes, PLUS additional practice materials not in the audio. Vocabulary glossaries (with English definitions). Interesting, relevant and contemporary topics & discussions. The pack comes as an instant digital download of MP3 & PDF files, compatible with the vast majority of computers, smart phones & tablet computers. To save the eBooks, right-click and then choose 'save link as' or 'save destination as'. To save the audio/MP3s, right-click and then choose 'Save link as' or 'Save destination as'. How do the Zapp! English packs work together? At Zapp! English we know that repeated exposure to words and phrases in many different contexts is the key to not only knowing the meaning, but of being able to use language correctly and with confidence. For that reason, each of our 32 unit topics runs throughout each of our components (Listening, Colloquial, Vocabulary & Pronunciation etc.). We have chosen broad but motivating topics where you will naturally encounter words and phrases on several different occasions. Is this you? / Does this sound familiar? Do you have difficulty understanding English in a real life situation or when watching movies? Do you have limited time and money to spend on traditional classes, and would prefer to study at your own pace, where and when YOU choose? Too often in language learning materials, you are listening to unrealistic, unnatural speech, which means when you then try and use your English skills in the real world, you find you have no idea what's going on. The language simply doesn't sound like what you heard in class. When you use Zapp! English Super Pack, you'll be hearing English as it is really spoken. Is this level suitable for me? As a rough guide, this material is aimed at Upper-Intermediate to Advanced learners (Common European Framework of Reference for Languages B2-C1), but students both above and below that level can get a lot of benefit from it, and we've devised our tasks to help make this happen. At Level 3 we help you make further progress towards your Cambridge First Certificate in English (FCE), IELTS (International English Language Testing System) and Cambridge Advanced English (CAE) exams. Zapp! English Super Pack is revolutionary – in that it's almost impossible to find materials that support your language development through the medium of real, natural, unedited speech. So, to a certain extent all levels will find the materials challenging at first – because it's new. The most important thing you can do to improve your English, whatever your level, is to expose yourself to English at every opportunity.. The second most important thing you can do, is let go of the mentality that you need to understand every word if you're going to improve. It's simply not true, and in fact this attitude can hold you back. Even native speakers don't hear everything in a normal conversation. If you are below intermediate level – don't panic. We have designed tasks that will help you to focus on the overall meaning of what the recording is about. If you are above Intermediate, don't worry, you will still learn lots! Natural speech provides a wealth of new expressions that you just won't come across in typical materials. Your Free Valuable Bonus Materials Worth €29! FREE BONUS: Zapp! Your Pronunciation – A new and essential guide to the sounds and stress of English. Only available as an extra with Zapp! English Super Pack, this handy guide contains 23 minutes of audio and a 10 page eBook. It will guide you through the 44 sounds of English (as well as including the phonemic alphabet as a visual reference), help you understand common word stress patterns and the importance of sentences stress. Plus you'll have a bit of fun with some tongue twisters! FREE BONUS: A-Z English Expressions – A unique and useful record of loads of natural English expressions, including common informal expressions, phrasal verbs and collocations. Only available as an extra with Zapp! English Colloquial, this essential record of common phrases includes; a 76 pages of eBooks and 1.6 hours of audio, with conversation in an interactive format and pronunciation practice. 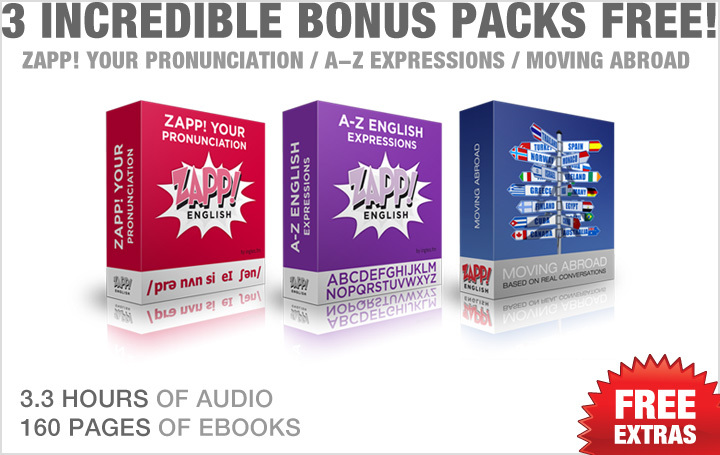 FREE BONUS: Moving Abroad – A new and exclusive series of 10 podcasts only available as an extra with our new Zapp! English Listening series. The pack contains 1.4 hours of audio, and 82 pages of eBooks (including transcripts). Listen to two North Americans, Eve & Ben as they talk about their new lives living and working in Barcelona, Spain. The podcasts contain real conversations, interactive vocabulary classes and pronunciation practice! We use a 100% secure, encrypted payment system to process payments. This system uses the same security protocols as online banking and the military. It's simple, fast, and completely safe. All products are delivered digitally in the universal PDF & MP3 formats. Download instructions and a link are sent immediately upon completion of the payment, and you will be able to start learning using your new materials within minutes! Our materials are based on solid and proven methods. We are 100% confident, that if you use our materials as instructed you will improve faster, sound more natural and generally be a better user of the English language. For this reason, if after ONE FULL YEAR from the date of your purchase, you don't think that using these materials (as directed in the product instructions) has helped to improve your English, just let us know and we will give you a refund. We are so convinced that our materials will help you significantly improve your English, that we are delighted to offer this One Year total money back guarantee. Please note: This refund policy is valid after one year, and is not for immediate refunds on recently downloaded products. For this reason, we ask that before proceeding with your purchase, you download the example e-books and audio to check that the level is suitable for you. A note about mobile phones & tablets: If you are using a mobile phone or tablet now, in some cases you will need to transfer the files to your computer before you can transfer them to your phone. You won't find another 'real English' product like this. You can study wherever and whenever YOU choose. Your listening skills, colloquial English and vocabulary & pronunciation will all jump up to an advanced level much sooner. You get THREE premium Packs for the Price of TWO! You get 3 BONUS PACKS with 3.3 hours of audio worth more than €29 included completely FREE! We're so confident your English will improve, we're giving you a FULL ONE YEAR guarantee! Invest Now Risk-Free and Get Instant Access! Just click the 'Add to Cart' button below, complete the whole secure payment process, and you will receive download instructions by email within minutes. P.S. 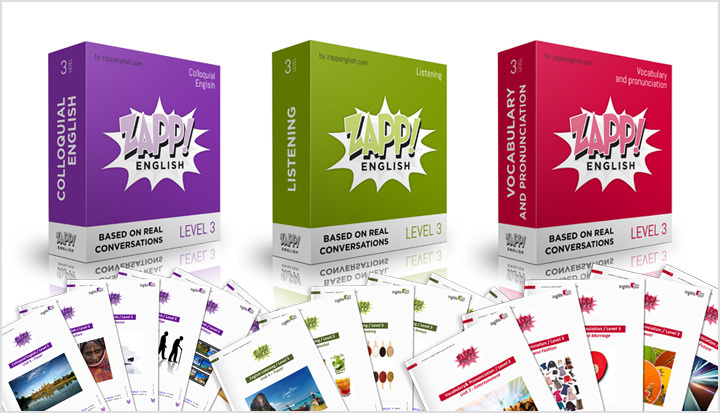 By investing in this pack you'll be entering a brand new Real English learning system. To take you up to an Advanced level of English in as short a time as possible. We look forward to welcoming you to Zappenglish.com!